Being treated like a princess at cafés always makes me want to go back for more. 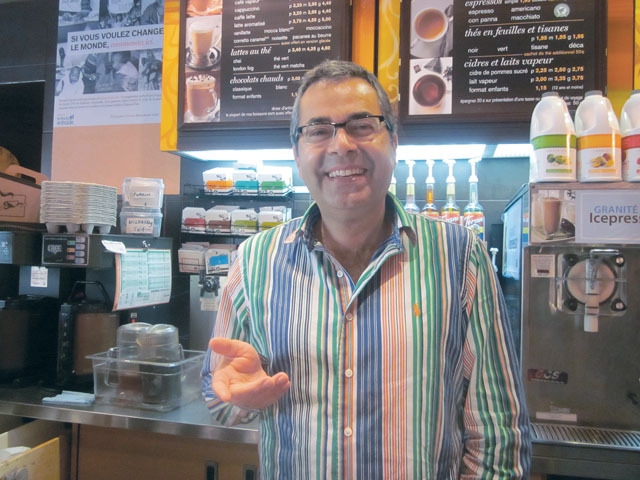 Whether it’s a franchise like Second Cup or family-owned and independent like Kokkino’s, the trick to doing good business is treating your customers like friends. Antoine not only knows my name, he greets me warmly every time I enter and instructs his new employees to treat me with kindness. He even hints at what I might be having so they can prepare themselves to receive the order. “Barbara has a small latte and something good to eat,” he tells them. Sometimes it is an apple baba (which I have convinced myself is only 200 calories); sometimes it’s a toasted bagel with cream cheese, sometimes a small sandwich or cookie or nothing at all besides the latté. This winter, when I was coughing my brains out, Antoine made me a delicious mint tea to take to my classes in a Second Cup reusable teacup. Sometimes, I’m dying for rye toast in the morning. Antoine doesn’t have it, but I’d rather sit myself down with a student or by myself for a coffee and whatever he does have if only for the greeting and welcome that comes my way. I’d bet my bottom dollar on this: People return to your business when you know their names, when you’re happy to meet their daughters and sons when they bring them in, and even the grandchildren (whom I’m sure Antoine will be happy to meet when I do have them). To see his smile is to love him and feel loved by him. Thanks, Antoine, for making my day, almost every day. Be the first to comment on "How to keep customers, in one royal step"